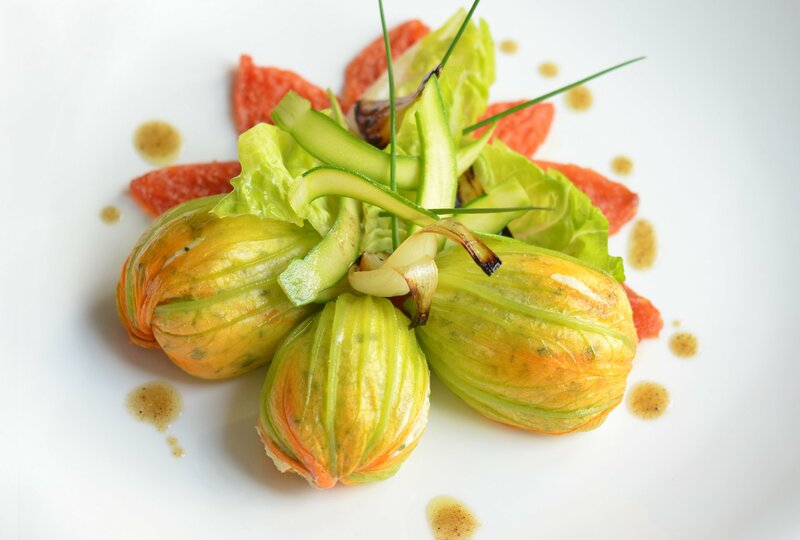 This month, Le Cordon Bleu Chefs have prepared a recipe with summer tones: Stuffed courgette flowers. Paired with oven-roasted tomato, this mouth-watering dish is worthy of any Provençal dish. Courgette flowers do not keep for a long time and for this reason, it should be used (eaten) rapidly, happily for us all. Preheat oven to 100 °C. Peel and seed the tomatoes and cut into petals. Place tomato petals on a baking sheet, drizzle with olive oil, sprinkle salt and sugar, and add some unpeeled garlic cloves and a few sprigs of thyme. Oven roast for 1 hour. Set aside the cooking liquid and transfer the tomato petals to a cake rack. Remove the stamens and trim the courgette stems. Separate 6 flowers from their courgettes; slice the flowers and reserve for the filling. Thinly slice the 6 courgettes on a mandolin for the decoration. Cut 3 new pearl onions into quarters and grill on the flat side, set aside. Slice the trumpet courgettes and remaining new pearl onions; sweat in olive oil. If needed, add water or vegetable stock and simmer, making sure the colour does not change as the liquid is reduced. Once cooked and cooled, roughly chop the cooked vegetables; add the shredded basil, ricotta, egg yolk, grated Parmesan and the 6 sliced courgette flowers. Mix to combine. Transfer to a pastry bag and pipe into each courgette flower. Peel and seed the tomatoes, sweat quickly in olive oil, deglaze with the wine vinegar; add tomato ketchup. Season and purée until smooth in a blender. Cut the little gem lettuce into 4 or 6 pieces. Rapidly pan fry the courgette slices in olive oil until just soft, about 30 seconds. Arrange a semi-circle of oven-roasted tomato petals in the center of the plate, position 3 stuffed courgette flowers on the other half of the circle. Spoon tomato sauce into the center of the circle and decorated with grilled onion quarters, softened courgette slices and chives. Pour around the reserved oven-roasted tomato cooking liquid. Courgette flowers, confit tomatoes, parmesan, olive oil, thyme, garlic, etc. A seasonal preparation which certainly conjures up images of the Mediterranean sunshine and a trip to Provence’s vineyards. This iconic plate with its Southern France feel calls for a very nice bottle from the Baux de Provence appellation. Domaine des Terres Blanches produces a delightful, invigorating rosé with amazing vitality. You will be charmed by the radiance of the salmon pink color and the palette of aromas laced with fresh apricot, juicy vine peach, star-anise and cranberry. On the palate the wine shows a fresh, streamlined profile despite the sunny climate, allowing a soft harmony between tartness, the generous character of Mediterranean grape varieties and the juicy fragrance which is so typical of the wines from this estate. This is all about the simple pleasures of authentic, organically-grown produce. Taste a glass imagining yourself in the foothills of the Alps surrounded by the sea and the mountains, enjoying the sun with a gentle, cooling Mistral breeze.